Artichoke – Dig Delve – An online magazine about gardens, landscape, growing & making. 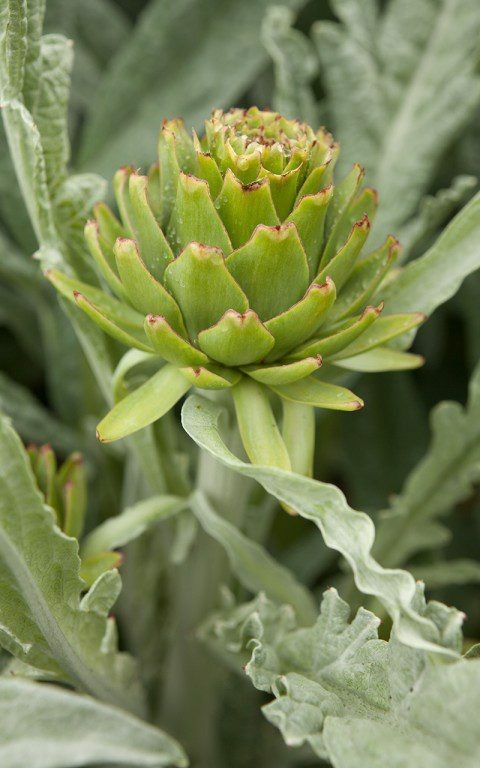 The globe artichokes (Cynara cardunculus Scolymus Group) were some of the first plants to go into the new kitchen garden. They are a luxury vegetable, taking far more space than they provide reward for and shading their neighbours if, indeed, there is room left in their shadow. Nevertheless, I gave them a bed to themselves, in prime position and against the radiated heat of the newly built wall. They have grown in spectacular fashion – which is the greater part of the reason for having them – doubling and trebling their bulk in the course of the first summer and continuing onward to take all the space which was offered them. Cold weather in combination with winter wet is their nemesis but, since they were planted, both winters have been mild and they have only had a brief down time in the darkest months when they retreat to a core cluster of leaves. Their aluminium foliage is wonderful in its ascendancy and as good as acanthus in its architecture. As soon as the weather warms in March it reaches from the clump, each leaf larger and more dramatic than the last, scrolling and bulking steadily until you see that, some time in May, the parent foliage has gathered enough energy for the flower spikes. These push proud of the forest of leaves, but it is whilst the heads are small that you need to curtail their reach and harvest the artichokes. We grow a variety called ‘Bere’, which Paul Barney of Edulis Nursery offers, and is the selection his father found growing in the walled garden there in the 1950’s. It is spinier than some of the named varieties, but Paul says it is the best tasting of them all. Indeed, it is a wonderful plant if you pick the heads whilst they are still young and before they are fully armoured. The best and meatiest parts are still soft when the leaf spines are forming, but leave them to harden and fulfil their thistly leanings and you end up with an impossibly fibrous mouthful. I plan to split my clumps in the spring, when growth is on the move and the crowns are manageable. Being mediterranean, they start life as soon as there is warmth and moisture in combination but, being sensitive to the cold, you have better chances in spring than if you move them at end of the season. It is a two-man job to lift the clumps and then prise a division, with root, from the clump. The divisions or ‘starts’ will be planted in the new herb garden, where they will provide ornamental architectural structure amongst the herbs. I have six plants now, far too many of the same variety, so the plan is to thin the ‘Bere’ to three and equal it with the same number of purple-tinged ‘Romanesco’ to make up the half dozen. ‘Romanesco’ is an altogether friendlier plant without spines, and the scales that form the thistle head are soft and can easily be harvested and prepared without the need for gloves. 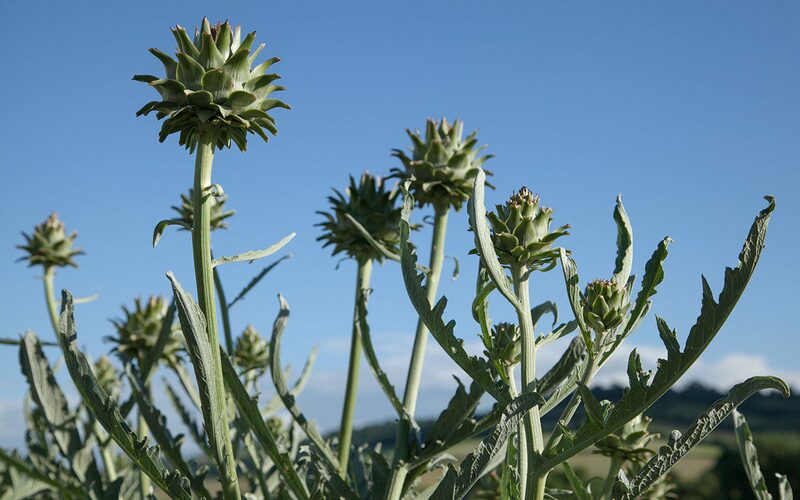 Each plant will be spaced a metre apart and inter-planted with stands of bronze fennel, which will cover for the artichokes’ collapse, which happens in high summer once all their energy has gone into flower production. At this point, once the old leaves start to fail revealing bare ankles, it is best to cut the lot to the ground and let the foliage regenerate. It will be back for the autumn, whilst the fennel covers during the recovery period. 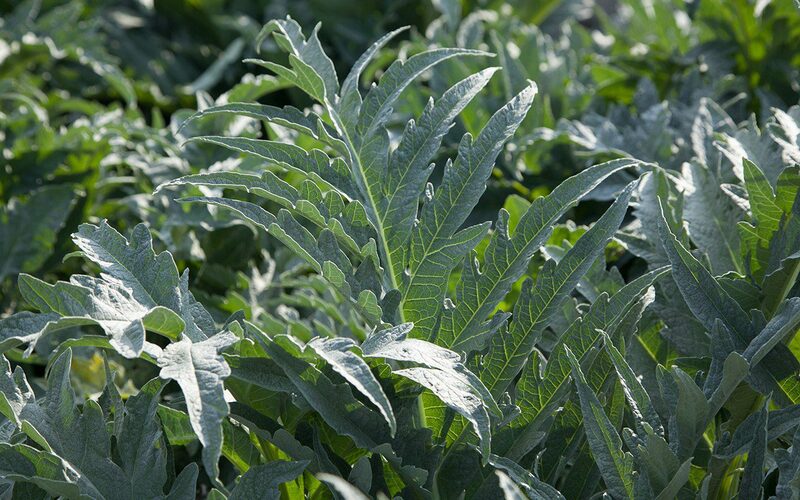 In Italy the cardoon is also prized in the early spring for its edible leaves. The midribs, which look like celery, are stripped of the leaves and fibres, and then blanched and buttered, or baked in a gratin. You need rhubarb amounts of room for such a short season vegetable, but if you do have a spare corner in sunshine they are sure to provide you with drama at the very least. 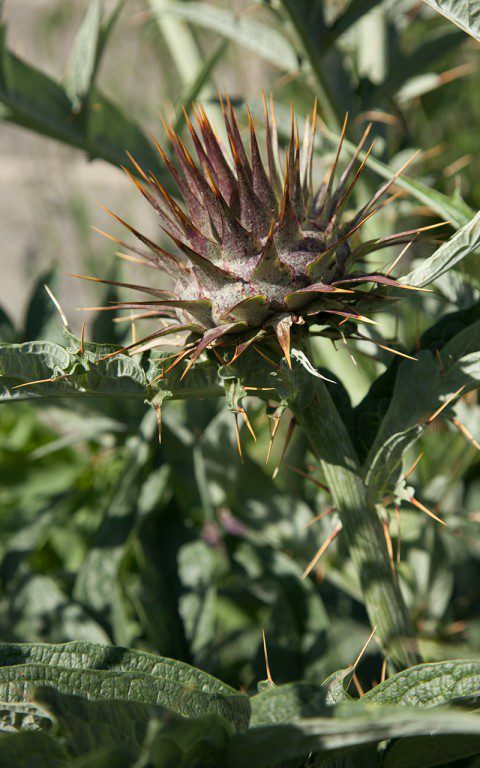 I first grew the ornamental cardoon (Cynara cardunculus) as a border plant at Home Farm. Innocent looking divisions arrived from Beth Chatto, as beautifully wrapped in damp newspaper as they are described in her catalogue. They were planted in an ambitious group of three on a sunny slope and took their position, rearing up in a mound of metallic foliage. Tapering in August to a magnificent pinnacle of branching flower, the plants reach about three metres in height, and need staking if they are not to topple once the flowers break colour. Look up and you see bees staggering about drunk on the fist-wide pools of neon violet filaments. The butterflies love them too, but the giant needs to be felled if it is not to leave you with a gaping hole once the collapse starts to happen. At Home Farm I planted it within a corral of late summer perennials, spaced at a sensible distance so that they can swallow the hole whilst it regenerates. Asters and rudbeckia will do the job, but you have to give the cardoon space in spring as it is an early season riser. Fergus Garret pointed me to a dwarf form that they have in the garden at Great Dixter and I grow it here against the barn. I am not usually a fan of plants selected for dwarfism, but this cardoon makes for a better-behaved plant. It is distilled in all it’s parts, and more evil to the touch, the undersides of every leaf defended with an armoury of needle-sharp spines. Its foliage is as beautiful, possibly more finely divided, and certainly more compact. It tops out at about a metre and so avoids the need for staking. 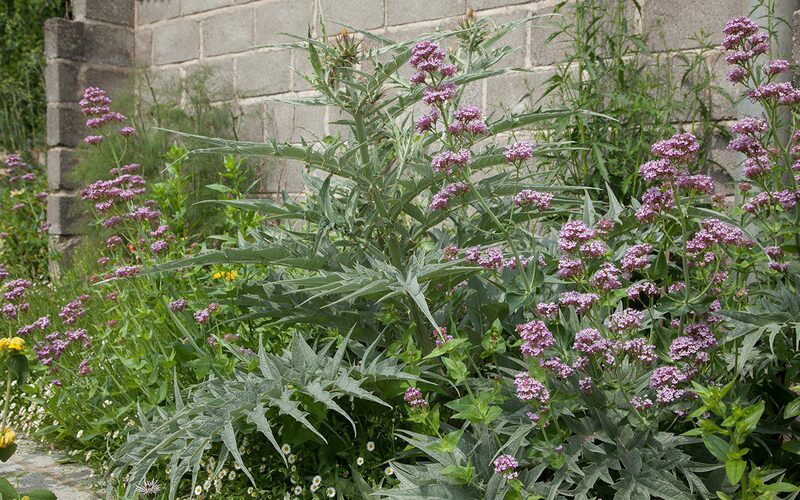 In the border where I grow it with Centranthus lecoqii and Romneya coulteri it has taken it’s territory, but the repercussions are altogether more manageable, and I still feel I have the drama I am looking for.